Sarah Connor (Linda Hamilton) is so over all these damn Terminators. Tim Miller’s Terminator: Dark Fate is a sequel that ignores most of the existing films in the franchise. It’s not a huge surprise, given how badly the Terminator series veered off course over the years (let’s try to forget—but never forgive—Terminator: Genisys). 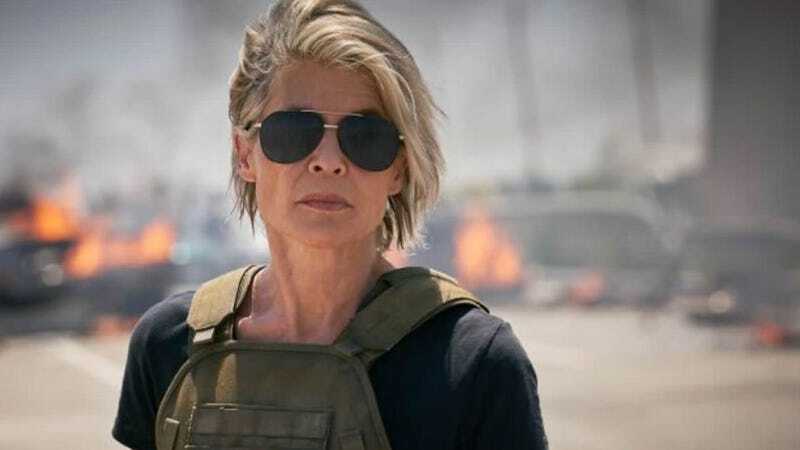 Now, star Linda Hamilton is revealing more about why she chose to return after almost 30 years away, and how they’ve “returned to form” with Dark Fate. In an interview with Collider, Hamilton talked about joining the cast of Terminator: Dark Fate, having last been part of the franchise in Terminator 2: Judgement Day. The series continued without her, producing three more films and a TV show over the course of a couple of decades (her character was even killed off at one point). But Dark Fate has chosen to ignore the canon of those films, setting itself after the events of T2. And yes, Sarah Connor is back. Hamilton also mentioned it’s been great working with Miller, who helmed the first Deadpool, but said it was difficult getting a sense of the action (which my colleague Germain Lussier praised in the first glimpse of the upcoming film). She said at one point she had to sit back and trust that Miller knew what he was creating in the action sequences, even if she couldn’t grasp what the hell was going on. I guess we’ll all have to wait and see. Terminator: Dark Fate arrives November 1.